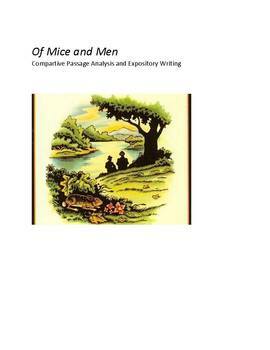 Chapter 1 and Chapter 6 in Steinbeck’s novel Of Mice and Men are close reflections of one another. 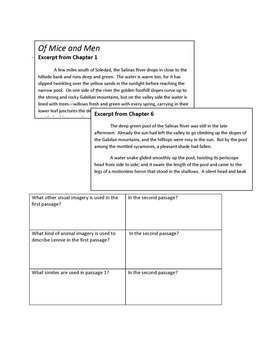 Once students have read the book, they need to do a close reading of prepared excerpts from the two passages. The use of various types of imagery and figurative language choices make these seemingly simple passages come alive. A chart is included that requires students to find twelve different types of literary devices. Because these chapters are the beginning and the ending of the book, it is also important that they look at what Steinbeck did in making his characters, not just the setting, come full circle in the text. The assignment has students examine tactile, auditory, and visual imagery in these passages. Metaphors, personification, and similes are examined as well as the multiple types of animals, both literal and figurative, used in these short descriptive passages. An answer key is provided for the comparative chart. Two expository writing assignments are included that require students to use the information from their close reading of these passages. Suggestions for themes and imagery that students may want to use in their writing are included in the teacher guidelines. Common Core Standards for reading, writing, and language are included. 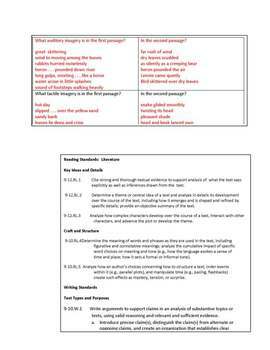 Included are : a five page student handout with a teacher answer key, two pages listing common core standards, and teacher instructions for the passage analysis and the two different expository writing assignments.